Leuven is a university town located 30km to the east of Brussels. The first references to the town may go back to the 9th century, but it was not until the 12th century that Leuven started to flourish as an important trading center for cloth. Later, during the 15th century (i.e. 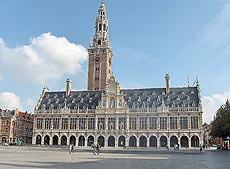 in 1425) the University of Leuven was founded. Leuven has a rich heritage and various historical buildings from different centuries can be admired. Its finely sculpted Town Hall and Saint Peter's church with the famous 'Last Supper' by Thierry Bouts, are fine examples of flamboyant Gothic architecture at its best. The Baroque style can be found in St Michael's church, in the interior of the St John the Baptist's church, and in the unrivalled stucco of the Park Abbey. Other styles can be found in The Romanesque Gate, the Saint Lambert's church and the remains of the first town walls. Various other historiocal buildings belong to the patronage of the university (see below). Next to its cultural heritage, Leuven provides an excellent environment for relaxation in its numerous bars and restaurants. The Old Market, locally known as 'the largest pub of Europe', is known for its lively nightlife, and a large collection of the famous Belgian beers are served. Beer has played an important role in Leuven's history. At present, the headquarters of the worlds largest brewery group AB Inbev are located in Leuven. First records go back to the 15th century to the 'Den Hoorn' brewery. The Beguinage (Dutch: 'Begijnhof'), was founded in the 13th century outside the town wall of the time. The oldest houses date from the 16th century when the original houses were replaced by brick structures. The 72 houses are generally named after a saint or a Biblical event. The church, dedicated to St. John the Baptist, is early Gothic. The date of construction, 1305, is carved into the right buttress of the north portal. Approximately 300 beguines (Dutch: 'Begijnen') lived in the 'Begijnhof' in the 17th century. The 'Begijnen' were women who lived a religious life but kept their own property and supported themselves. They did not make perpetual vows. The movement was very strong throughout the Low Countries. The 'Groot Begijnhof' is now a University residential quarter for students, professors, and employees of the University. Foreign guests are also housed here. There is room for 500 people. The Infirmary of the 'Begijnhof' has been converted into the Faculty Club, a place for the academic, scientific, administrative, and technical staff of the University to meet. The Chièvres Convent (Nr. 39) has been converted into a congress center. On 31th March 2000, it was officially recognised as an UNESCO World Heritage site.